The Wednesday, January 27, 2016 Climate Justice Forum radio program hosted by Wild Idaho Rising Tide (WIRT) discusses the decline of oil-by-rail and oil and gas development funding, the East Coast blizzard worsened by climate change, a federal moratorium on coal leasing of public lands, a blockade of the Trans Mountain tar sands pipeline terminal test drilling, and other breaking fossil fuel resistance news. Broadcast on progressive, volunteer, community station KRFP Radio Free Moscow every Wednesday between 1:30 and 3 pm PST, live at 90.3 FM and online, the show covers continent-wide climate activism and community opposition to extreme energy projects, thanks to the generous, anonymous listener who adopted program host Helen Yost as her KRFP DJ. On behalf of over 3200 members, friends, and allies of Wild Idaho Rising Tide (WIRT), including potentially impacted, concerned north Idaho residents near the proposed and existing rail routes affected by this proposal, I respectfully offer and request inclusion in the public record of these comments regarding the Tesoro Savage Vancouver Energy Project draft environmental impact statement (DEIS), during the public agency and citizen review period from November 24, 2015, until January 22, 2016 . WIRT and associates collectively object to state permitting of the Tesoro Savage oil train terminal planned for the Port of Vancouver, Washington, which would impart myriad, significant risks and only marginal rewards for communities along the rail tracks and bridges, rivers, and lakes of Tesoro’s and Savage’s profitable thoroughfare to crude oil export. In support of this official letter of resistance to Washington state Energy Facility Site Evaluation Council (EFSEC) approval of this application and resulting, destructive, implementation activities, we thoroughly concur with, contribute toward, and incorporate the concerns, oral testimony, and comments of all project opponents. The Tesoro and Savage corporations intend to build the biggest crude-oil-by-rail terminal in the U.S. at the Port of Vancouver, potentially transferring an estimated 360,000 barrels per day of explosive Bakken shale oil and volatile Alberta diluted bitumen (tar sands) to tank farms across the Columbia River from Portland, Oregon, and to huge, ocean-going oil tankers shipping it to West Coast refineries and the world market . Inevitable, disastrous, consequent oil spills into river, lake, or sea waters along rail and ocean routes, especially releases of thick tar sands oil that sinks to the bottom of waterways, would devastate local and regional waters and environments, fisheries, tribal lifeways, communities, and economies. While moving enormous volumes of oil that ultimately impact our shared global climate, the Tesoro Savage facility would also increase the risk of fiery oil train accidents in countless communities along Northwest rail lines, from the Hi-Line around U.S. Highway 2 in Montana, to U.S. Highway 95 corridor towns from Bonners Ferry to Rathdrum in northern Idaho, to the dangerously elevated bridge and track funnels through the Sandpoint, Idaho area and downtown Spokane, Washington, to the Columbia River Gorge between eastern Oregon and Washington, to Vancouver [3, 4]. Every day, the huge oil terminal would bring four or more 100-car, mile-long trains toward the West Coast, hauling flammable cargo through climate-change-drying forests, increasingly dense cities, and ever more precious water bodies. Public officials and emergency responders across the Northwest have raised concerns about the severe threats of oil train derailments, explosions, and pollution, as such incidents continually proliferate [5-7]. The Wednesday, January 20, 2016 Climate Justice Forum radio program hosted by Wild Idaho Rising Tide (WIRT) discusses oil and gas development and resistance in Idaho, the bankruptcy of a Powder River Basin coal mining and export facility proponent, the Delta 5 oil-by-rail blockader trial and verdict, and the recent Tesoro-Savage oil train terminal hearing in Spokane Valley, including recorded testimony. Broadcast on progressive, volunteer, community station KRFP Radio Free Moscow every Wednesday between 1:30 and 3 pm PST, live at 90.3 FM and online, the show covers continent-wide climate activism and community resistance to extreme energy projects, thanks to the generous, anonymous listener who adopted program host Helen Yost as her KRFP DJ. The Monday, January 11, 2016 Climate Justice Forum radio program hosted by Wild Idaho Rising Tide (WIRT) discusses the Delta 5 oil-by-rail blockader trial, Tesoro-Savage oil train terminal hearings, a TransCanada Keystone XL pipeline lawsuit against the U.S. government, and dropped plans for a Payette River-side gas well, a Grays Harbor oil terminal, and Northwest coal and oil train traffic. Broadcast on progressive, volunteer, community station KRFP Radio Free Moscow every Monday between 7:30 and 9:00 pm PST, live at 90.3 FM and online, the show covers continent-wide climate activism and community resistance to extreme energy projects, thanks to the generous, anonymous listener who adopted program host Helen Yost as her KRFP DJ. 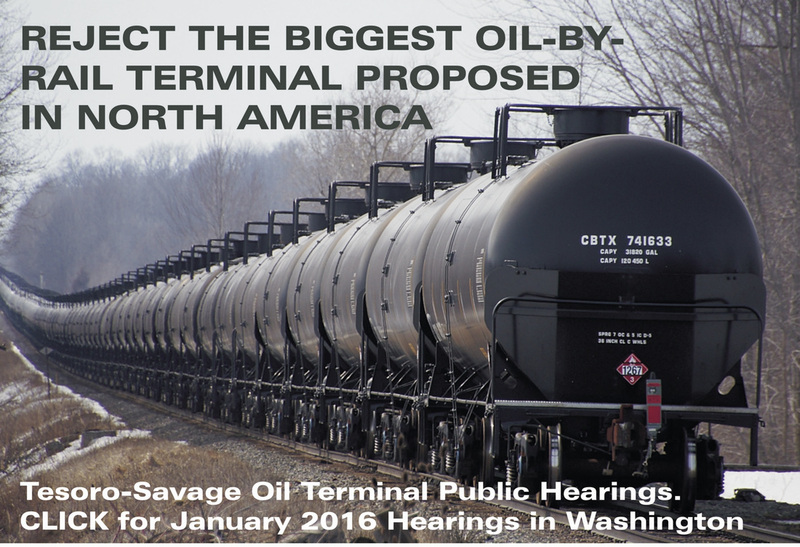 On Thursday, January 14, 2016, please join Wild Idaho Rising Tide (WIRT) and allied groups carpooling from Moscow and Sandpoint, Idaho, and Pullman, Washington, to participate in the 4:30 pm regional community rally against the Tesoro-Savage Vancouver Energy Project, an oil train terminal proposed for the Port of Vancouver, Washington. At the same location – Centerplace Regional Event Center at 2426 North Discovery Place in Spokane Valley, Washington – the Washington state Energy Facility Site Evaluation Council (EFSEC) is hosting a public hearing on the project’s draft environmental impact statement (DEIS), from 5 to 11 pm or until the last testifier, hopefully late at night after many opposing speakers [1, 2]. Big Oil plans to build the largest crude-by-rail terminal in North America, potentially transferring an estimated 360,000 barrels per day of explosive Bakken shale oil and volatile Alberta diluted bitumen (tar sands) to tank farms across the Columbia River from Portland, Oregon, and to huge, ocean-going oil tankers shipping it to West Coast refineries and the world market . Inevitable, resulting oil spills into river, lake, or sea waters along rail and ocean routes, especially releases of thick tar sands oil that sinks to the bottom of waterways, would disastrously affect local and regional environments, communities, and economies. While moving enormous volumes of oil that ultimately impact our shared global climate, the Tesoro-Savage facility would also increase the risk of fiery oil train accidents in countless communities along Northwest rail lines, from the Hi-Line around U.S. Highway 2 in Montana, to U.S. Highway 95 corridor towns from Bonners Ferry to Rathdrum in northern Idaho, to the dangerously elevated bridge and track funnels through the Sandpoint, Idaho area and downtown Spokane, Washington, and down the Columbia River Gorge between eastern Oregon and Washington to Vancouver [4, 5]. The huge oil export terminal would bring four more 100-car trains hauling flammable cargo through climate-change-drying forests, increasingly dense cities, and ever more precious water bodies every day. 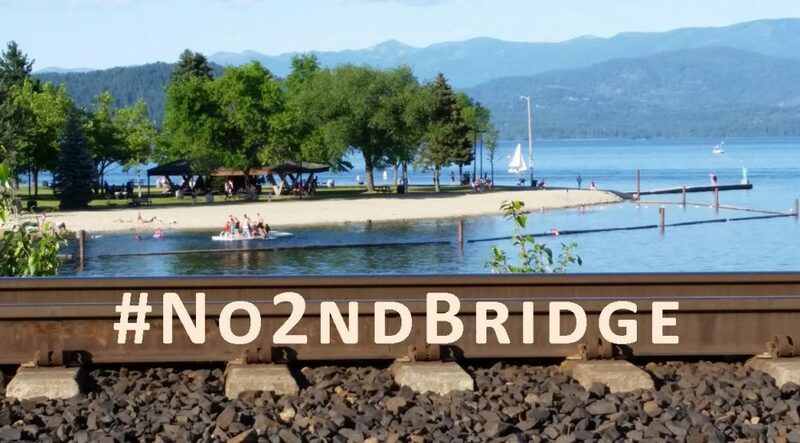 Public officials and emergency responders across the Northwest have raised concerns about the severe threats of train derailments, explosions, and pollution, as such incidents continually proliferate [6-8]. Northwesterners have successfully delayed, re-routed, and/or stopped similar fossil fuel infrastructure plans over the last five years, most notably tar sands mining and refining megaloads, coal export terminals, and just this week, a Grays Harbor oil terminal . Faced with a flood of proposed coal, oil, and liquefied natural gas terminals in the Pacific Northwest, hundreds of concerned citizens like you have attended hearings to tell decision-makers no. Altogether, people power has delayed nine fossil fuel terminals and stopped nine others in Oregon and Washington. The Monday, January 4, 2016 Climate Justice Forum radio program hosted by Wild Idaho Rising Tide (WIRT) discusses an upcoming direct action training workshop, the Delta 5 oil-by-rail blockaders trial, hearings on the proposed Tesoro-Savage oil train terminal, a relinquished Payette River-side gas well permit, and lessons from the Black Lives Matter movement. Broadcast on progressive, volunteer, community station KRFP Radio Free Moscow every Monday between 7:30 and 9:00 pm PST, live at 90.3 FM and online, the show covers continent-wide climate activism and community resistance to extreme energy projects, thanks to the generous, anonymous listener who adopted program host Helen Yost as her KRFP DJ.